Pumping of concrete is very common in today’s concreting in relatively less accessible construction site and also concreting in greater elevation. We have discussed about concreting at highest elevation with the power of Putzmeister pump. Before performing such operation in unbelievable elevation, some tests were conducted to examine capability of pumps and also to evaluate different connections within pumping system. We have to choose a pipe system that is inert i.e. concrete do not react with any constituent of piping system together with less friction resistance. 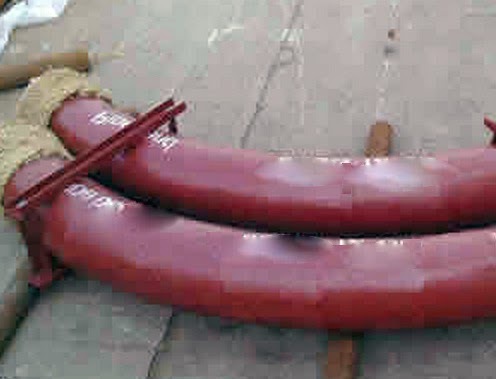 Sometimes flexible hose of short length is used at discharge end to facilitate placing. With convenience of placing, it produce substantial increase in friction which produce also some loss in pumping head. On the other hand aluminum pipes produces another forms of problems. We know cement is a potential source of alkali. Aluminum is found to react with alkalies remain in cement. This reaction produce hydrogen gas which is harmful for concrete. The harm is done by introducing voids, by hydrogen gas, in hardened concrete. We know voids in concrete primarily reduce strength; the impact is low density, high permeable concrete and other susceptibility of deformation of concrete is induced. Dear reader so what is ideal material for piping system? Dear reader to have answer of these question you have to wait for next post. Please stay with us. Your share interesting valuable informaion.